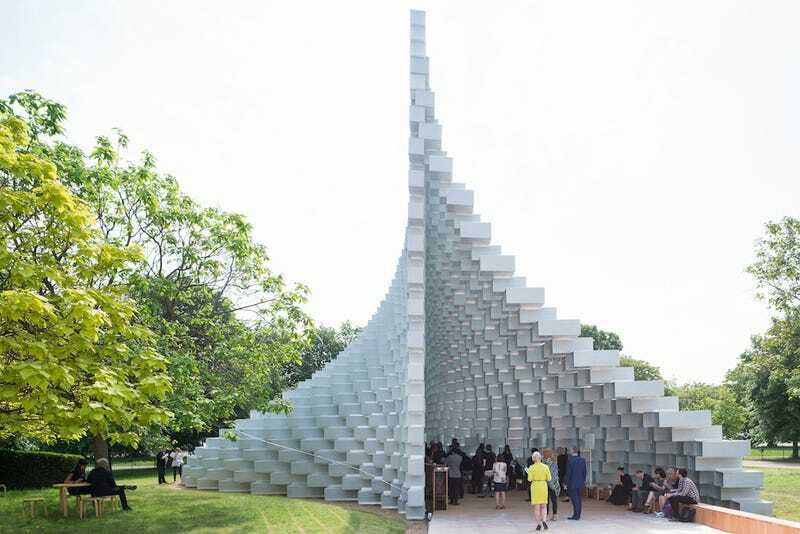 Each year, the opening of the Serpentine Pavilion heralds the beginning of summer with a temporary structure installed in a London garden. This year, the pavilion was designed by Bjarke Ingels, the Danish superstar architect who was recently brought onboard to design Hyperloop One stations. Depending on where you stand, it’s either a very convincing take on a contemporary Minecraft cathedral, or a fancy modern house for Q*bert. Ingels’ vision for the pavilion was an “unzipped” stack of blocks. He worked with a furniture fabricator to design a cube out of translucent fiberglass that could be staggered and bolted together (which is kind of his thing). The way they made the cubes is a method called “pultrusion” where fiberglass is pulled through a mold to keep the fibers in the resin perfectly straight, resulting in a very strong object. Which means the structure is sturdy enough to climb on, but you can only go as high as a wire that politely suggests ok that’s high enough, thank you. It’s actually pretty amazing to see how different the structure looks from different angles. From one side, it looks like a honeycomb for robot bees. From another angle it’s a perfect rectangle, with the cubes refracting and reflecting the landscape into an almost disco ball-like surface. And sometimes it looks like a pixelated limestone canyon. Inside, flooring and furniture made from the same fiberglass material will serve as a space for performances and events. The pavilion is open until October 9.